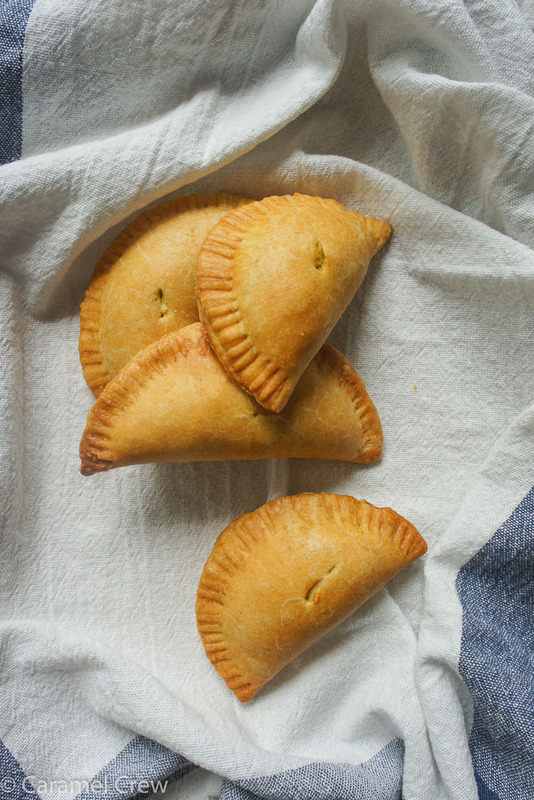 Empanadas are like mini meals baked in cute savory hand pies – check out my favorite recipe for spicy, cheesy chicken empanadas and bake yourself some real comfort food. Chicken empanadas are one of my favorite things to make when I need a light lunch to go or just a really tasty and satisfying savory snack. I have experimented of lot with different empanada dough recipes to get the great texture and flavor, and have found that using corn flour, or masa harina, is absolutely essential. The corn flour gives the empanadas that authentic feel and make the crust taste so much better than with plain flour. The dough is very simple to make and easy to work with, and how many empanadas you get from this recipe really depends how thin you want to roll the dough. I actually like the dough pretty thick, so I got 7 empanadas the last time I made these. But feel free to roll that dough more thin and you will get more, just make sure the dough doesn’t end up too see-through so it won’t break apart in the oven. How big rounds you take from the rolled dough also naturally affects the number of empanadas you get. Adjust the amount the curry powder according to your own taste, my curry was pretty mild so I used it generously to get a really strong, robust flavor since the cream cheese will mellow out the heat quite a bit. Also, if your curry powder has salt in it, you should omit the 1/4 teaspoon of salt in the filling ingredient list. These are delicious when warm and fresh from the oven, but you can always store them in an airtight container in the fridge and then warm them up in the microwave before eating. 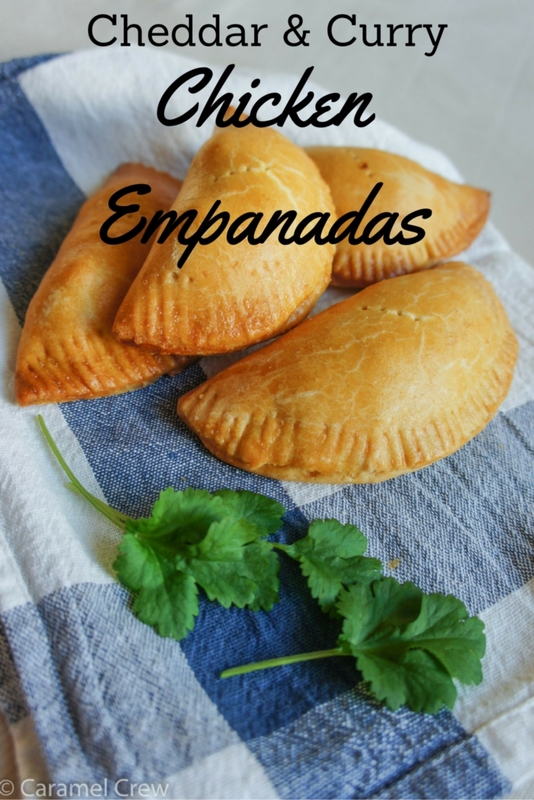 This is a great, simple empanada recipe that can adjusted easily – I am going to make a vegetarian version next, with some fresh jalapenos to turn up the heat. The cheddar and cream cheese is the perfect pair to make almost any filling alternatives a tasty choice; just use your imagination (mushrooms! beef! pepperoni!turkey!) and go make some empanada magic. 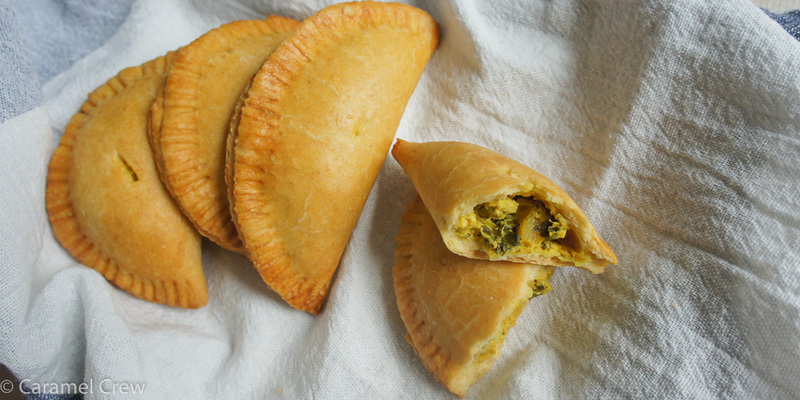 Savory chicken empanadas with a creamy curry & cheddar filling with fresh cilantro. 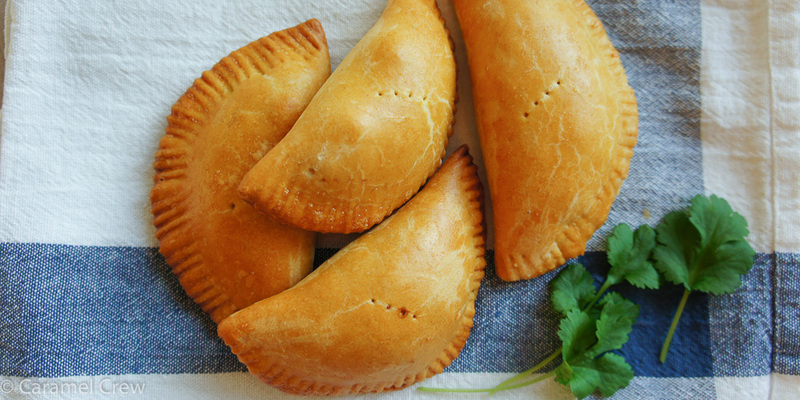 Easy empanada recipe for the ultimate comfort food, snack or appetizer. Mix all-purpose flour, corn flour, baking powder, curry powder and salt in a bowl. Add canola oil. Add 1/2 cup of water, mixing with your hand. If the dough feels too dry and difficult to process, add water 1 tablespoon at a time until you get a pliable texture. Shape the dough into a ball and wrap tightly in plastic wrap and place in the refrigerator for the time you take making the filling. Heat a tablespoon of butter on a frying pan, add chicken pieces, diced bell pepper, diced shallot, salt and curry powder. Fry until the chicken is cooked through. Set aside to cool slightly. In a bowl, combine cream cheese, grated cheddar, cilantro, parsley, ground coriander and ground cumin. Mix to combine. Add the chicken mixture and mix. Flour a working surface and roll out the dough to about 1/4 inch thick. 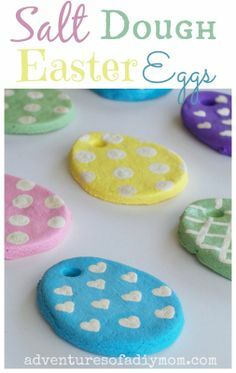 Cut out circles the size of your liking, with a cookie cutter or similar. 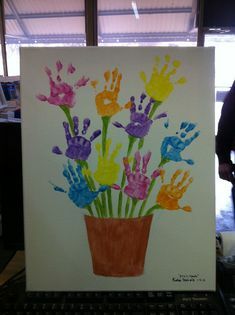 Divide the filling equally on the rounds, making sure to leave at least 1/2 inch border without filling. 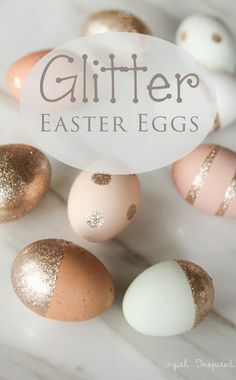 Make the egg wash by lightly whisking an egg with a tablespoon of milk. 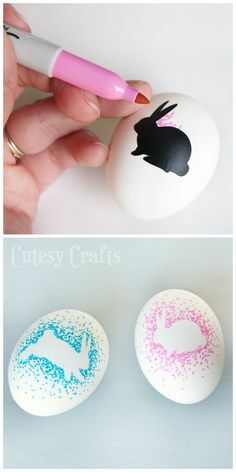 Brush the edges of each circle with egg wash, fold the circle in half over itself to make a half moon shape and pat the edges together with your finger. Seal the edges by pressing tightly with a fork or crimping with the edge of your pinkie finger. Transfer on a plate, cover with plastic wrap and refrigerate for 30 minutes. 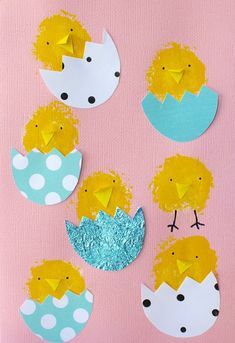 Save the egg wash for brushing. Pre-heat the oven to 375° F.
Place the empanadas on a baking sheet lined with parchment paper, brush with the leftover egg wash. Prick each empadada with a fork or cut steam vents with a sharp knife and bake for about 25-30 minutes, until the color is rich and golden. 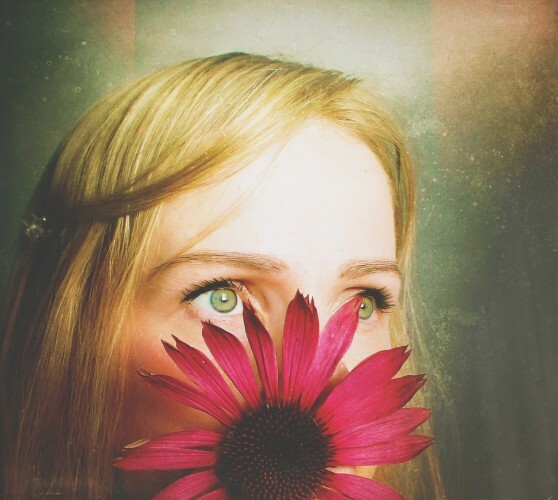 Take care not to burn.